Photography is an expensive hobby. You might’ve started with something small and inexpensive, like a point and shoot camera. But, then the passion was probably too much to control, so you moved onto a more manual camera, or even a DSLR. Then came all the fancy lenses and tripod. 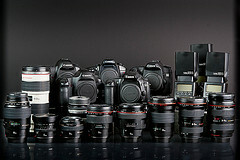 And, before you knew it, all your camera gear became more valuable than your car. If that sounds anything like you, then it might be a good idea to consider getting insurance for all of your camera gear.